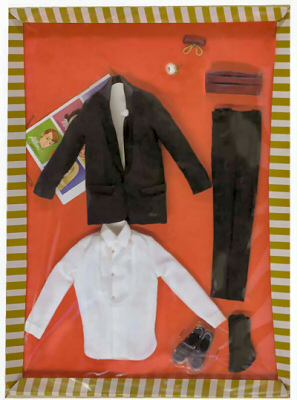 This is one of the most, if not the most, sought after vintage Ken ensembles for the early years. It is a very classy and elegant ensemble that looks absolutely wonderful displayed on Ken along with a Vintage Barbie doll modeling one of her lovely formal gowns. Ken's tux jacket is fully lined and has satin lapels and a white boutonniere. His tuxedo shirt has 3 pearl buttons. The tux pants have a fly front and satin side stripes. The white corsage is very, very hard to find.